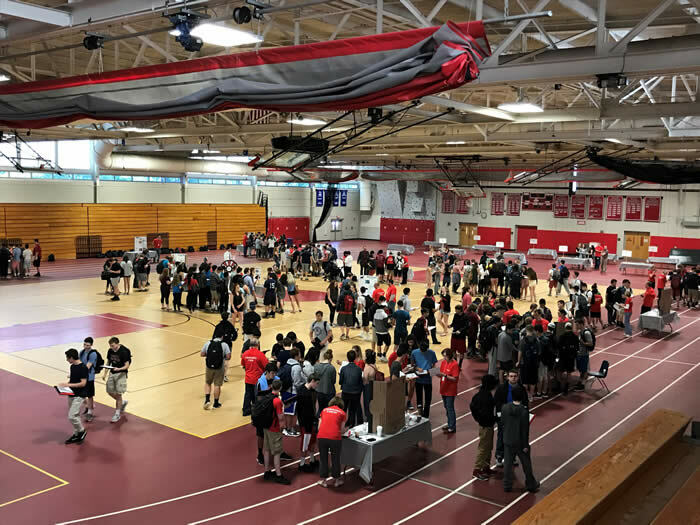 Reading, MA – On Thursday, June 8th, Reading Cooperative Bank teamed up with Reading Memorial High School and local volunteers to offer the class of 2018 a chance to roleplay as adults living on a budget with the “Lessons for Life” Financial Fair. These Juniors went through a simulation that underscores finance and expenses in the real world. The fair allowed students to make fiscal decisions based on their monthly income. Monthly income was determined by an assigned occupation for each student. After visiting 15 different pricing booths (like Housing, Transportation, Entertainment, etc.) and choosing how to invest their money, students sat with a financial advisor who crunched the numbers to see if they could live within their means. This was a fun exercise for students to learn basic budgeting and financial skills. Reading Cooperative Bank is a depositor owned co-operative founded in 1886. This community-centric North Shore financial service provider has branches in Reading, Wilmington, North Reading, Woburn, Andover, and Burlington. They also operate teaching branches at Northeast Metro Tech in Wakefield (open to the public) and at Reading Memorial High School (students and staff only), as well as an online branch at readingcoop.com.